For years, these well-known photos of a barge submarining through a strong current in the West Flood Gate have been misidentified. 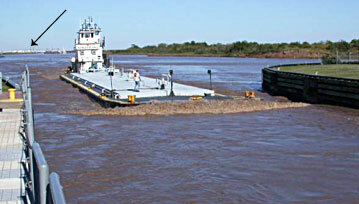 In the top photo, the arrow points to Freeport on the horizon behind the towboat, looking to the east. This can only be seen from the east entrance of the Brazos River East Flood Gate, not the West Flood Gate, as stated in earlier publications. Also, the current it is encountering would be from the Brazos River not the San Bernard River. 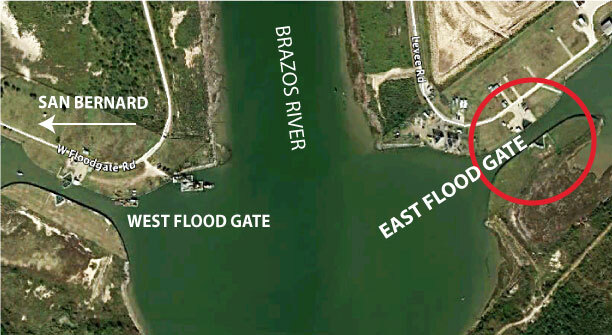 This map shows the location of the East and West Brazos River Flood gates on the Intracoastal Waterway with the Brazos River flowing south to the Gulf between them. 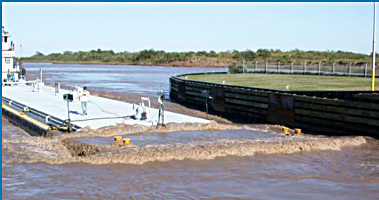 The barge, in the top photo, is entering the east entrance to the East Flood Gate (red circle) traveling west. It has repeatly been erroneously identified as entering the West Flood Gate encountering current from the San Bernard located four miles to the west.